Nekoda has always been so patient with me for all my learning goals! It’s been a long winter, and a long time since I did a blog post! I want to kick start spring by sharing some exciting news. I spent many hours over the last year preparing my application to join The American Hoof Association. The AHA is an educational organization dedicated to promoting awareness of the healthy lifestyle paradigm as the basis for improved hoof quality among horses. This certification holds trimmers to a high standard for knowledge of hoof care, nutrition, and lifestyle. About eight years ago, I learned how to trim my own horses. I had three at the time, and so it seemed to make sense that I learn how to maintain their feet myself with some guidance from my trimmer. I also found the new skills helpful in assessing what my clients’ horses might need to improve balance and soundness. Once I became more confident I began offering trimming as part of the package for training horses. This has been a fairly organic process, as I have only taken on more trimming horses through word of mouth. Before and after photos of a clean up trim. We started a nutrition program for this horse six months ago, and you can see the top half of his hoof is growing in without cracks. The bottom half shows signs of nutritional deficiencies and weakness from prior care. Eventually my goal was to achieve a certification through a barefoot trimming resource to ensure my level of skill and ability were well enough developed before officially offering the service as an addition to the rest of my business. And who better than the AHA; a world renowned organization. The process was tedious, with multiple in depth case studies, write ups and video documentation. I just received the *jump up and down* news that I had been accepted into the AHA in January. The world of barefoot trimming is growing, though it is still small in comparison to traditional blacksmithing and farriery. There is only a fraction of programs available to immerse yourself full-time in natural barefoot care, although this is growing too. For my training I chose to follow an experienced master barefoot trimmer local to my region, take trimming clinics, and study theory from highly respected books and video resources. This collaborative education is not complete, as there is so much new scientific evidence coming into the world of hoof care all the time. This little pony has a long way to go with his laminitis rehab, but he moves out more sound after every trim and treatment. The lines drawn resemble how the internal structures are affected by the trim. I am also happy to share that I am now affiliated with Barefoot Horse Canada. 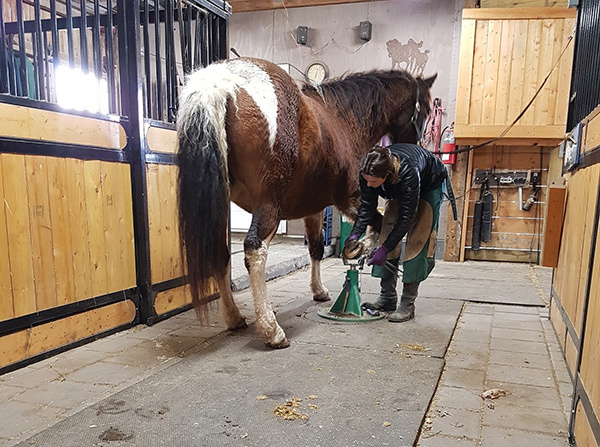 This association has a wealth of information on its website for anyone interested in learning more about natural barefoot hoof care, nutrition and the importance of lifestyle for optimal wellness. I was welcomed to do a talk on behalf of Barefoot Horse Canada recently through Equine Erin. Myself along with two other professionals in the industry shared information regarding our practise and hoof health. I have teamed up with a friend of mine, Natalie Zoratto, Regenerating Touch Equine Massage. We are launching our Equine Rehabilitation program this spring. This program will give horse owners the opportunity to send a horse with injuries, laminitis, respiratory conditions and other health challenges to our farm for full time specialized care to regain optimal health. More details to come. Happy Spring everyone! Please feel free to contact me with questions at www.FreeReinHorsemanship.com for details and consultations.